No longer does the trade close at 5pm, let the system negotiate on your behalf and buy and sell 24 hours a day 7 days a week. Sold vehicles are automatically deleted so if it's on the site, it's available. Know who you’re dealing with. Scores and comments for both sellers and buyers. Search by as many criteria as you want - including Price, Condition and Relation to book. Constantly updated with new stock in real time. Customisable so you only see the vehicles that are relevant to you. 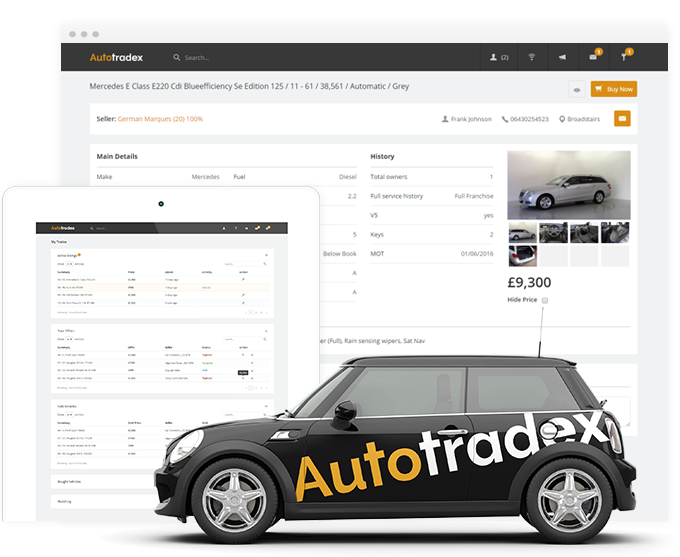 Show your customers available vehicles while keeping margins confidential with our 'hide price' feature. Fix a price or invite bids, it’s your choice. Trade through the site, or the old fashioned way over the phone - it’s up to you! All traders are vetted and constantly monitored. Designed specifically to save you time and money, giving you instant access to the vehicles which are specific to you. Unlimited buying, unlimited selling and all for one low monthly price.